This is Burano, one of the hundreds of islands around and part of Venice! That’s my favourite part of Venice because it’s so colourful and so beautiful! It’s not a big island at all but the whole atmosphere is amazing! Burano is famous for it’s cute, colourful houses and also handmade lace is everywhere! You have the option to just buy anything with lace or you can even attend a ‘class’ for an hour or two, where you’ll learn about the history of the island and watch a demonstration. Definitely a must-visit place in Venice!!! This photo depicts the process of creating a horse figure from the famous Venetian glass. Everywhere in Venice you’ll stumble upon all kinds of products from glass: figures, jewelry, lamps, etc. This is the island where the famous Venetian glass originates from! That’s why it’s called Murano glass! The whole demonstration was really interesting and the outcome was even more impressive! At the end of the day I got to see the beautiful sunset! It was even more magical than during the day! You just have to experience as much as you can! However, I still had soooo much more to see, unfortunately I didn’t have enough time. This city can surprise you every time you visit it! Stay tuned for the last part of my trip, where you’ll see how magical Venice is in the evening! amazing pics! you know i've never been in venice! Aww I love Venice sooo much, great pictures ! I loved how vivid and colorful Burano is!! I didn't have time when I was there to visit Murano as well, but it's on my to-do list for my next visit. I love how the homes were so bright and colorful, so that the fishermen could see their houses when they were out at sea. So cute and inspirational! It makes me want to paint my own home a bright color someday. 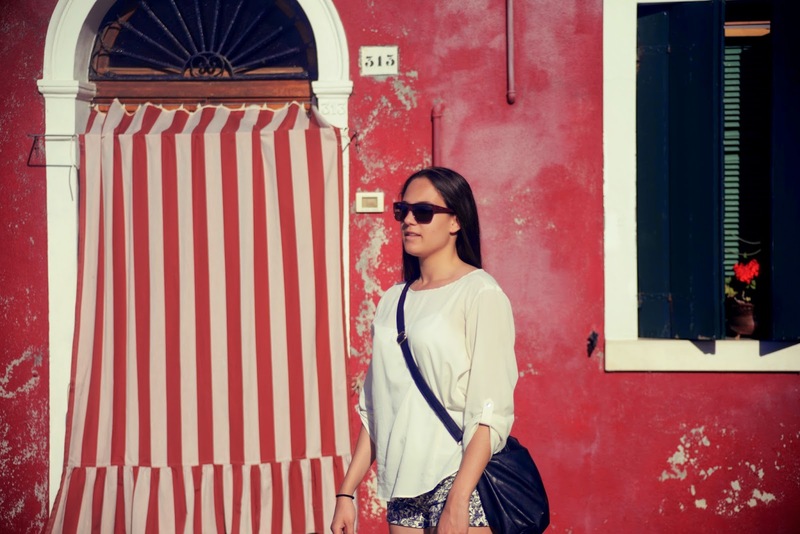 It's hard to believe that places like Burano really exist! It's too cute for words! I'm so jealous right now, Venice looks amazing! These pictures are gorgeous! I love all the color! Thank you for following my blog, I'm now reading yours via GFC. OMG! such a beautiful pics!!! you both look adorable for walking arround the channels! amazing place full of life, you look beautiful!! Love so much your pics! wow, Venice looks so magical! TOP↟ 🙂 ♥ ♡ ♥ ♡ supeeeeeer! omg venice looks amazing!!! need to go there asap! Sunsets just seem more magical in Venice. I would love to visit there someday. Lucky you!! I'd love to see Venice, especially Burano. I had no idea there were so many colourful homes! That looks so picturesque and charming. I've also received glass gifts from friends who've been to Murano, though had no idea there were places were you can view the process. That would be interesting! so pretty! wish I went to that part of Venice! Amazing pics glass show seems interesting! I love these pictures! So the boats serve the same purpose as cars? So cool. Have a great weekend! Wow amazing pictures,love the bright colors of the city! Follow for follow ,let me know. Lovely photos! I really want to go back to Venice now! I went to Venice but not to Murano and Burano, that was quite a shame! I love fabric shopping and I would want to get a piece of handmade lace. It would be awesome. Do you want to follow each other's blogs? Let me know what you think!